What’s up ? This is THE stephane ANDRE. With my training, I’m interested in biomechanics to avoid injuries. I read « Sport Medicine Media Guide » and I learned some good stuff. A stress fracture is an overuse injury. Human body creates a new bone to replace a bone that has been broken due to the stress of everyday life. This process is done every day to keep the balance. Unfortunately, this balance can be disrupted because of excessive physical training. There are several factors that can prevent the body from creating enough bone and this make microcracking, called « fracture stress ». The most common factor of fracture stress is an excessive increase in the intensitiy or frequency of physical activity without adequate rest period. 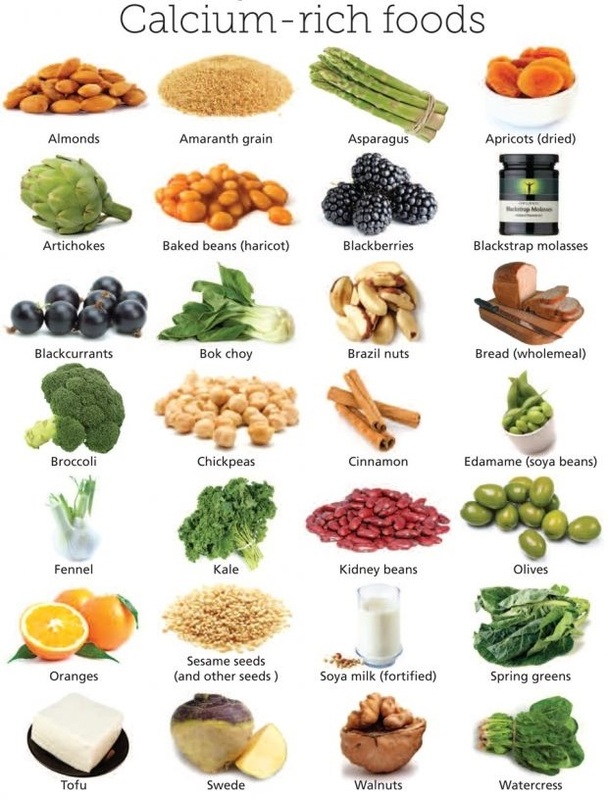 Other factors are nutritional deficiencies, mechanical influences, lack of sleep, systemic factors (hormonal imbalance, etc.) and metabolic bone disorders. There are case of development of eating disorders and/or amenorrhea (infrequent menstrual periods) for some female athletes who are preparing for a competition. These 2 conditions can create a decrease in estrogen that can decrease bone mineral density. This increase the risk of stress fractures. 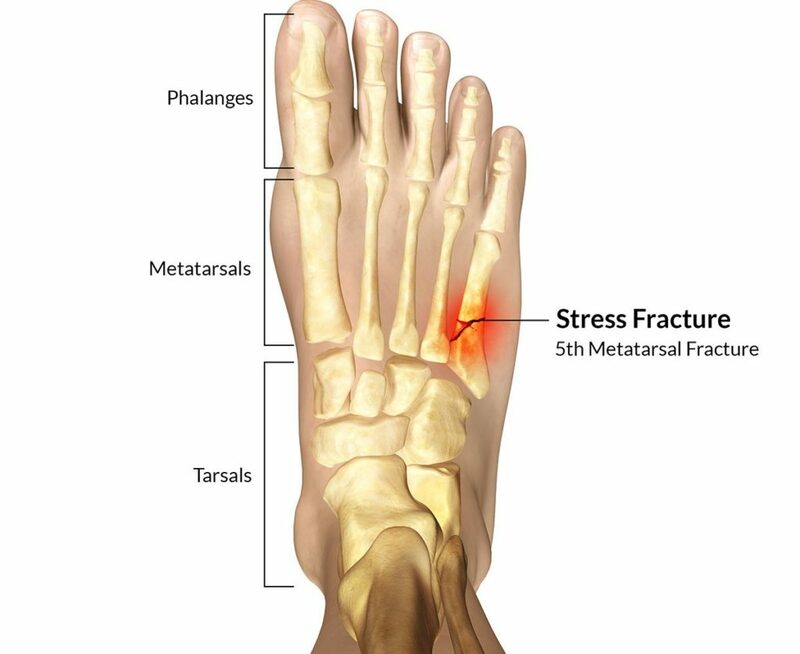 Stress fractures are often seen in athletes (especially runners) or military recruiting. For an athlete, 1.6km run is 110 tons of force absorbed by the legs. Bones aren’t made to resist this force (energy) so it’s the muscles that have the function of absorbing shocks. When the muscles get tired, they stop absorbing the forces and eveything transferred to the bones. 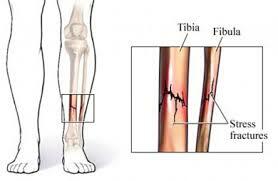 Stress fractures occur in almost all bones but are more common in lower bone, expecially the tibia. Depending on the type of sport, there’re distinctive stress fractures such as the elbow in throwing sports, the ribs in golfing and rowing, the spine in gymnastics, the lower extremity in running activities and the foot in gymnastics and bascketball. Stress fractures create pain in a limited area directly above the tip of the bone where the fracture occurred. The pain is raw because of physical activity and relived with rest. The sensitivity of the bones is the most obvious conclusion to the physical examination. With regard to X-rays, this isn’t a tool that actually helps to diagnose an early stress fracture because the bone often looks normal and the microcracking aren’t visible. It’s difficult because after several weeks of rest, the bone begins to repair itself and shows a healing reaction or callus on X-rays. An early stress fracture is usually confirmed by a bone scan or magnetic resonance imaging (MRI). Stress fractures are generally classified as low-risk (will not become a serious fracture) or high-risk (will become a serious fracture). 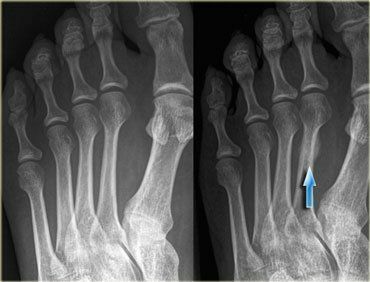 Low-risk stress fractures usually require a rest period of 1-6 weeks of limited weight bearing activity progressing to full weight bearing may be necessary. Return to physical activity should be a gratual process. Low impact activities like swimming or biking are recommended to maintain cardiovascular condition when the pain is gone. When the patient can comfortably perform low impact activities for long, pain-free periods, the patient can begin high-impact activities. High-risk stress fracture have the danger of becoming a complete fracture. For athletes suffering from chronic pain and having normal x-rays results, it’s recommanded to use a bone scan or MRI. High-risk stress fractures should be treated as traumatic fractures (with cast or surgery) because of complications. When an athete does a new sport activity, it’s necessary to program progressive goals. For example on the 1st day, don’t run 8km but rather increase the distance gradually per week. Cross-training => Alternate activities to achieve the same fitness goal helps to avoid stress fracture injuries. For example to achieve a cardiovascular goal, alternate cycling and running (cycling one day and riding the other day) is excellent. Adding strength training and doing flexibility exercises help improve performance. 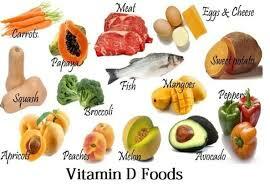 Have and maintain a heathy diet with foods rich in calcium and vitamin D.
Use good equipment. Don’t use running shoes, gloves, etc, very old and very worn. If during physical activity it start to swell or the pain starts, stop the activity right away. It’s essential to rest for a few days. If the pain continue, you should see an orthopedic surgeon. It’s important to recognize early symptoms and treat them appropriately to return to the sport with a normal level of play. Stress fractures occur less frequently in those of black African descent than in Caucasians, due to a generally higher BMD (bone mineral densitiy) in the former. Women and highly active individuals are also at a higher risk, The incidence probably also increases with age due to age-related reductions in BMD. Children may also be at risk because their bones have yet to reach full density and strength. The female athlete triad also can put women at risk, as disordered eating and osteoporosis can cause the bones to be severely weakened. P.S. If you’re in Miami and you like Caribbean food, go to my cousin’s bistro to eat Haitian food, click here . Rotator cuff is a group of 4 muscles and their tendons that together form a « cuff » around the head of the humerus (upper end of the arm). The 4 muscle, originate from the scapula (shoulder blade), are upraspinatus, infraspinatus, subscapularis and teres minor. Tendons of each muscle fit on the humerus tuberosity. The causes of a rotator cuff tear can be an acute injury such as a fall or because of chronic wear with tendon degeneration. For people over 40 years old, the pinching of the tendon on the underside of the scapula may participate in tearing. 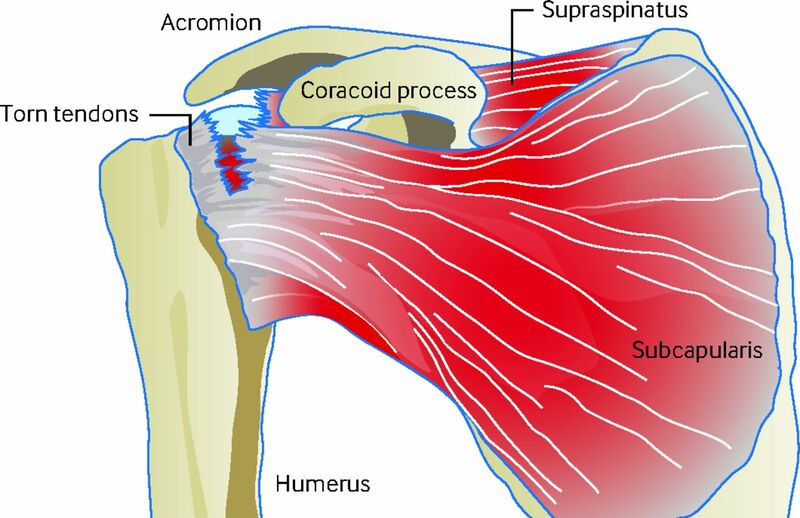 Diagnosis of rotator cuff tears is based on an examination and/or diagnosis study such as a MRI (magnetic resonance imaging) to confirm the diagnosis. Diagnosis early on in the first symptoms and rotator cuff’s treatment can help to boost the treatment’s results. 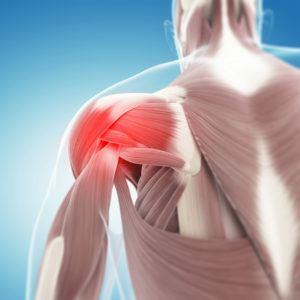 Goals treatment are to relieve pain and restore strength to the injured shoulder. Several tears in rotator cuff can be treated without surgery. Anti-inflammatory drugs, steroid injections and physical therapy can all be beneficial in treating the symptoms of a tear in the cuff. Even though a full-thickness tear needs to be cured with surgery, it’s possible to use non-surgical treatments to have a satisfactory function in some cases. Surgery is recommended if there is persistent pain or shoulder weakness that doesn’t improve with non-surgical treatment. Often patients who have surgery indicate nocturnal pain and difficulty using the arm for lifting and reaching. Many will indicate persistent symptoms despite several months of treatment and limited use of the arm. Surgery is also recommended for active people who use the arm for overhead work or sports. The type of repair performed is based on the findings at surgery. A partial tear my necessarily only a trimming or smoothing procedure called a debridment. A full-thickness tear with the tendon torn from its insertion on the humerus is repaired directly on the bone. Whether for the treatment of non-surgical and surgical rotator cuff tear, rehabilitation has a very important role. Usually recovery is at least 6 months or more depending on the extent of the tear. When there is a tear, there is frequently a loss of shoulder movement. An exercise or physical therapy program is needed to restore strength and improve shoulder function. Although surgery repairs the defect of the tendon, the muscles around the arm remain weak and an important effort is necessary in the rehabilitation so that the procedure is a success. After surgery, a complete re-education can last several months. 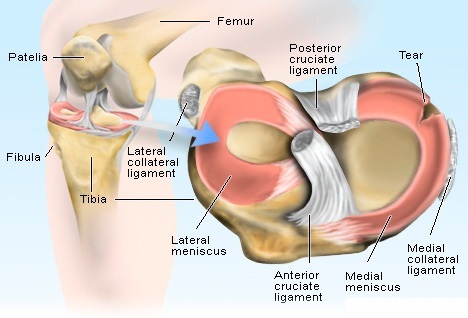 Meniscal tear is one of the most common knee injuries in athletes. This is caused after a contact injury or a traumatic twist. The meniscus is a wedge-shaped cartilage that provides a cushion in the medial and lateral portion of the knee joint and acts as a « shock absorber ». It’s located in the area of joints contact to prevent the bones rub between them because of the bodyweight. It’s hard and rubbery to help cushion the joints and keep the knees stable. 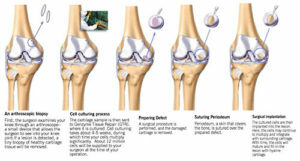 It’s important to also know that the meniscus helps to nourish the knee by facilitating the diffusion of joint fluid. With this injury, athletes can experience acute pain with a swelling and often a catching or locking sensation. A meniscus injury can be diagnosed on the basis of the story that the patient provides and a physical examination of the knee. An orthopedic surgeon my also use other techniques to further diagnose such as magnetic resonance imaging (MRI), which gives a 3-dimensional image of the inside of the knee joint. In some cases, a surgeon can perform an arthroscopic inspection of the articulation, this is a minimally invasive surgical procedure. A small meniscus tear can be treated with rest, ice and anti-inflammatory medications. When a meniscus tear causes a significant loss of movement or catching, the appropriate treatment is often a surgical operation. Depending on the location and type of tear, the treatment may be a simple arthroscopy to remove the torn fragment. Depending on how quickly the inflammation disappears, athletes can return to a full activity after a week or months. For athletes with a repairable tear, sutures are used to sew the meniscus. In this situation, the knee is braced for 6 weeks. These athletes take at least 3-6 months to back to their activities but maintain the full cushion in their knees. 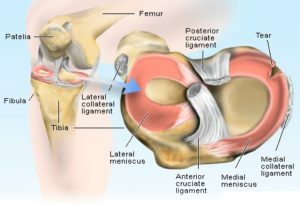 There is not really any way to prevent a meniscus tear apart from a conditioning program to try to prevent an acromioclavicular ligament (ACL) tear and knee instability. There are some variables of meniscus tears can be repaired and despite repair, they aren’t always heal. But arthritis can be avoided in the majority of cases when repair is successful. One study shows that 60% of patients who undergo meniscectomy (partial elimination) had some degree of progressive arthritis. What’s up ? This is THE stephane ANDRE. With my training, I’m interessted in biomechanics to avoid injuries. I read « Sport Medicine Media Guide » and I learned some good stuff. Articular cartilage is difficult to understand because there are 3 types of cartilages in the body : articular of hyaline cartilage (covers joint surfaces), fibrocartilage (knee meniscus, vertebral disk) and elastic cartilage (outer ear). These cartilage’s types differ in their structure, elasticity and strength. 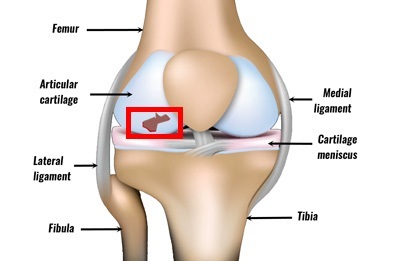 Articular cartilage is a complex element, it’s a living tissue that is on the joint’s surface. 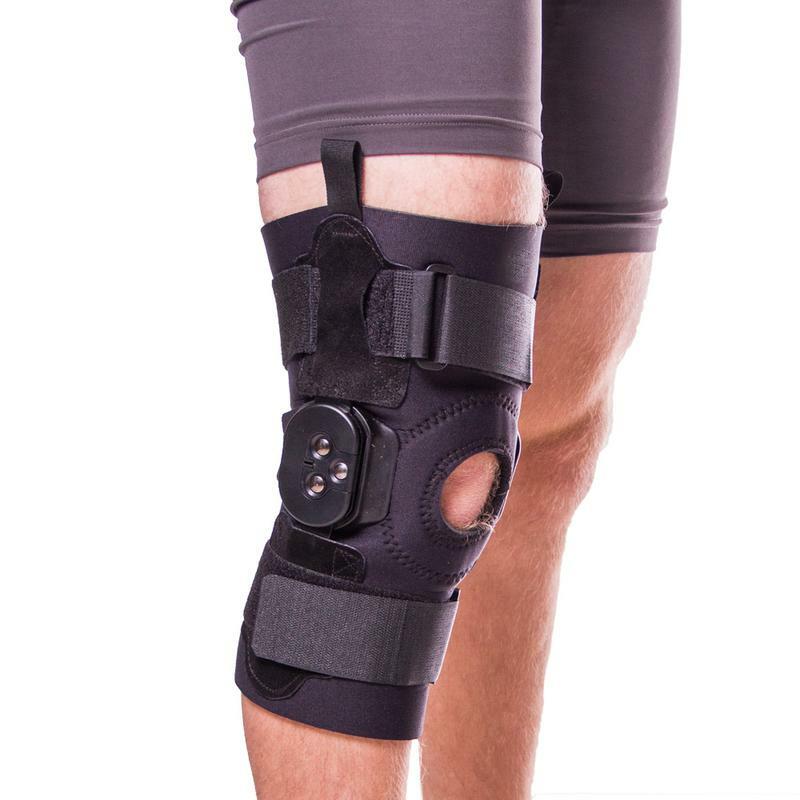 The function is to provide a low friction surface to allow the joint to withstand weight loads through the range of motion needed to perform activity of daily living. To put it simply, articular cartilage is a very thin shock absorber. It’s built in 5 distinct layers and each layer has a structural and biochemical difference. 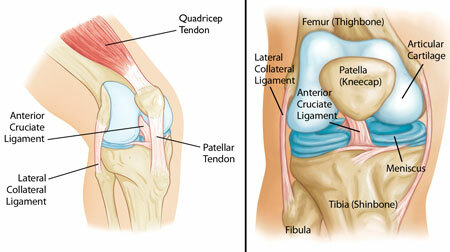 Articular cartilage injury may be due to trauma or progressive degeneration (wear and tear). This can be mechanical destruction, a direct blow or other trauma. The healing of articular cartilage cells depends on the severity of the damage and the location of the lesion. Articular cartilage has no direct blood supply so it has very little ability to repair itself. It the lesion penetrates the bone under the cartilage, the bone provides blood in the area which improves the chances of healing. Mechanical degeneration (wear and tear) of articular cartilage occurs with progressive loss of normal cartilage structure and function. This loss begins with the softening of the cartilage, then progresses to fragmentation. As the loss of articular cartilage lining continue, the underlying bone no longer has any protections against normal wear and tear of daily life and begins to get damaged leading to osteoarthritis. In many cases, a patient experiences knee swelling and vague pain. At this stage, continuous physical activity isn’t possible. If a loose body is present, words such as « locking » or « catching » might be used to explain the problem. With wear and tear , the patient often experiences stiffness, decreased range of motion, joint pain and/or swelling. The physician examines the knee to look for a decrease in range of motion, pain along the joint line, swelling, fluid on the knee, abnormal alignment of the joint’s bones, and ligament or meniscal injury. Cartilage lesions are difficult to diagnose and it’s possible that the use of magnetic resonance imaging (MRI) or arthroscopy may be necessary. Plain X- rays don’t usually diagnose articular cartilage problems but they used to rule out other abnormalities. Articular cartilage injury that doesn’t penetrate the bone doesn’t repair itself. A lesion that penetrates the bone can heal but the type of cartilage created is structurally unorganized and doesn’t work as well as the original cartilage. Lesion less than 2 cm have the best prognosis and the best treatment options. These options are arthroscopic surgery using techniques to remove damaged cartilage and increase blood flow from the underlying bone (drilling, pick procedure or microfracture ). For smaller lesion of articular cartilage surgery is not required. 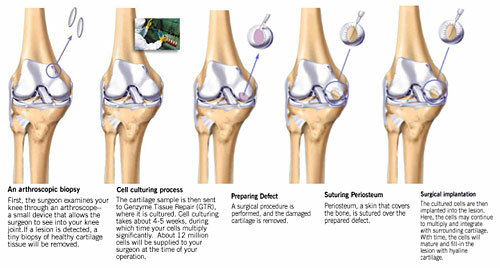 For larger lesion, it’s necessary to transplant the articular cartilage from another area of the body. Talk to your doctor or specialist to have more information about the decision to have a surgical operation. For patients with osteoarthritis, non-surgical treatment consists of physical therapy, lifestyle modification (for example reducing activity), bracing, supportive devices, oral and injection drugs (like non-steroidal inflammatory drugs, cartilage protective drugs) and medical management. Surgical options depend on the severity of osteoarthritis and may provide a reduction in symptoms that are usually short-lived. Total osteoarthritis may relieve the symptom of advanced osteoarthritis but this usually requires a change in the lifestyle and/or level of activity of the patient. Based on published studies, the overall prevalence of articular cartilage injury in the knee is 36% among all athlete and 59% among asymptomatic basketball players and runners. Don’t Be Too Serious ?